On Monday, schools will be shut down across Oklahoma as rank-and-file teachers look to build on the momentum of the West Virginia strike. The historic victory in West Virginia has inspired teachers and staff across the United States. Marches, rallies, and sickouts in defense of public schools have spread to Kentucky, Arizona, Wisconsin, and beyond. Whether this movement becomes a bona fide strike wave will depend to a significant degree on what happens in Oklahoma over the coming days. Demanding major increases in pay and school funding, Oklahoman educators are set to strike on April 2. The similarities with West Virginia are obvious. In a Republican-dominated state with a decimated education system and a ban on public employee collective bargaining, an indignant workforce teetering on the edge of poverty has initiated a powerful rank-and-file upsurge. But history never repeats itself exactly. To strike and win, Oklahoma workers will have to overcome a range of distinct challenges and obstacles. Years of austerity have devastated Oklahoma’s education system, as well as its public services and infrastructure. Since 2008, per-pupil instructional funding has been cut by 28 percent — by far the worst reduction in the whole country. As a result, a fifth of Oklahoma’s school districts have been forced to reduce the school week to four days. The roots of this crisis are not hard to find. Taxes have not been raised by the Oklahoma legislature since 1990. Due to a right-wing 1992 anti-tax initiative, a supermajority of 75 percent of legislators is now needed to impose new taxes. Yet the need for a supermajority was not a major political issue until very recently, since there has been a strong bipartisan consensus in favor of cutting taxes. Some of the first major tax breaks for the rich and corporations began in 2004 under Democratic governor Brad Henry and a Democratic-led Senate. One recent study estimates that $1 billion in state revenue has been lost yearly due to the giveaways pushed through since the early 2000s. Republicans swept into the state government in 2010 and promptly accelerated this one-sided class war. Governor Mary Fallin and the Republican legislature have slashed income taxes for the rich. They have also passed huge breaks for the oil and gas companies — not a minor issue in a state that is the third-largest producer of natural gas and fifth-largest producer of crude oil in the country. Even the fiscal fallout of the 2014 oil bust did not lead the administration to reverse course. The fact that Oklahoma, like West Virginia, is a so-called “red state” has obscured the existence of majority support for progressive working-class policies. In the 2016 primaries, Bernie Sanders received more votes than any candidate of either party. And an October 2017 poll found that a large majority of Oklahomans favor fully funding schools and other state services through raising the income tax on the rich, ending corporate tax breaks, and increasing the gross production tax (GPT) on oil and gas. In recent years, union-led efforts to reverse the attacks on public services and education have yielded few results in Oklahoma. On March 31, 2014, a big rally for public education took place at the state capitol — yet that very day, a legislative committee voted to further slash taxes. In 2016 an initiative was put on the ballot to give teachers a $5,000 raise. The measure was overwhelmingly defeated, in large part because the raise would have been paid for by increasing the state’s sales tax, instead of taxing the wealthy. More recently, in February of this year, a legislative proposal called Step Up Oklahoma — jointly backed by business leaders, the governor, and the OEA teachers’ union — would have given teachers a $5,000 salary increase, primarily by levying regressive sales taxes. The proposal failed to clear the 75 percent supermajority hurdle, but the very fact that leading Republicans were now talking about modestly raising taxes testified to their growing awareness that the crisis of public education had become a political time bomb. Oklahoma unions deserve credit for helping keep the issue of teacher pay and school funding squarely in the public eye over recent years. Yet, as in West Virginia, the initiative for the current movement has mostly come from below. It was a night in October, I had just gotten done with my third job when I got a text, saying: “Hey, my name is Larry Cagle, I’m a teacher nearby, I heard that you’re also frustrated with what’s going on, that you’ve been talking walkout.” So we met in Starbucks and traded stories from the school trenches. When Larry suggested we actually try to get things moving, I initially said I didn’t have time to do anything. But we eventually decided to create a Facebook group. Many of these teachers acted on our proposal to hold sickouts that month, to energize the OEA and legislature to fix the problems of public education in Oklahoma. From day one, this has been a grassroots movement. The union has been forced to play catch up. I’m in favor of unions — but we need strong unions. Another important independent initiative came from teachers, students, and their supporters in the town of Bartlesville. In the summer of 2017, teachers started floating the idea of a walkout for public education. The day after Step Up Oklahoma failed, on February 12, 2018, Bartlesville superintendent Chuck McCauley polled superintendents statewide about the possibility of a temporary suspension of classes to put more pressure on the legislature. Bartlesville students were the first to turn from words to deeds. Incensed by a new round of school budget cuts — $22 million in total — Bartlesville High School senior Chloe Maye took the initiative to call for a student walkout on February 22. The hundreds-strong action — and a contentious Facebook exchange between Maye and a state senator she invited to the protest — garnered wide attention across the state and helped generate momentum for further bottom-up actions. Oklahoma teachers have felt hopeless and powerless for years. So when I first heard about West Virginia, I didn’t think it would spill over for us. But teachers here started closely watching the strike. They began saying, “Wait a second, they did it there, they were able to get all counties to go out. Why can’t we do that here?” People saw that West Virginian strikers were strong, that they didn’t back down. The legislature gave a little and the union leaders said to go back to work, but the teachers and staff continued to strike anyways, until they won all their demands. Inspired by West Virginia’s example, strike fever rapidly spread across Oklahoma. On March 1, Alberto Morejon — a twenty-five-year-old middle-school teacher in Stillwater — created a Facebook group titled “Oklahoma Teacher Walkout — The Time is Now!” Within two days, the group’s membership shot up to the tens of thousands. This rank-and-file explosion immediately raised a critical question: who had a legitimate mandate to speak in the name of educators? Teachers’ unions in Oklahoma are even weaker than in West Virginia — but so are the networks of the militant rank-and-file. The OEA represents only roughly twelve thousand of the state’s forty-two thousand active teachers, as well as a smaller percent of support staff. This weakness is the result not only of Oklahoma’s reactionary anti-union laws, but also the manifest ineffectiveness of the OEA’s decades-long focus on lobbying the legislature and electing Democratic Party politicians. Meanwhile, unlike West Virginia, Oklahoma lacks a militant minority of well-rooted, radical workplace activists. It has often been overlooked that many of the teachers who initiated the strike in West Virginia were respected local union representatives and activists. This allowed them to lean on their existing city, regional, and statewide union infrastructure to push for the strike at the same time as they challenged the timidity and compromises of top union officials. In Oklahoma, the main leaders of the rank-and-file upsurge are almost completely divorced from the union. This has obliged them to rely very heavily on Facebook, a useful but limited mobilizing tool. Due to the absence of strong labor organizations or traditions, Oklahoma has not experienced the school-by-school votes to strike that played such a key role in building, unifying, and legitimizing the West Virginia action. Without these site-based democratic votes, it would have been far easier for West Virginia union officials or superintendents to subsequently monopolize the leadership of the movement. The depth of privatization in Oklahoma is another divide that any effective strike will have to confront. Many school janitors and cooks work for private contractors. And David Chaney, superintendent of Epic Charter Schools, has announced that its district of fourteen thousand will refuse to close any schools. For all of these reasons, the fight for statewide labor unity faces a more uphill battle in Oklahoma than it did in West Virginia. In this first test of strength between the movement’s contending wings, the union leadership backed down. On March 7, the OEA announced that the walkout would now begin on April 2 if the workers’ demands were not met. Proposing an immediate $800 million revenue increase, the union demanded a raise of $10,000 for teachers and $5,000 for support staff, $200 million for increased school funding, $213 million for state employee raises, and a $255.9 million increase in health care funding. The public employees’ union, the Oklahoma Public Employees Association (OPEA), soon afterward joined the call for an April 2 work stoppage. To generate the necessary funds, the OEA — together with the OPEA and the small American Federation of Teachers affiliate — proposed a revenue plan that mixed regressive and progressive taxes, in which the gross production drilling tax would be raised only back to 5 percent, rather than 7 percent or higher. Momentum for the strike grew steadily over the next three weeks. With the support of the OEA, teachers began “work to rule” protests, in which they ceased all extra work that is necessary for teaching but not specified in the contract. Across the state, teachers and community members prepared food and child care services for students during the impending strike. By all accounts, the movement has the firm support of parents and students alike. As in West Virginia, the state government has put forward last-minute concessions in an effort to stave off a work stoppage without conceding too much to workers. While teachers and staff rejected these maneuvers in West Virginia, it remains to be seen whether that militant pattern will be repeated in Oklahoma. A new legislative deal has put into question the content and duration of the April 2 action. On Wednesday, March 29, the legislature passed HB 1010xx, a bipartisan revenue bill. On Thursday, it was signed into law by the governor. 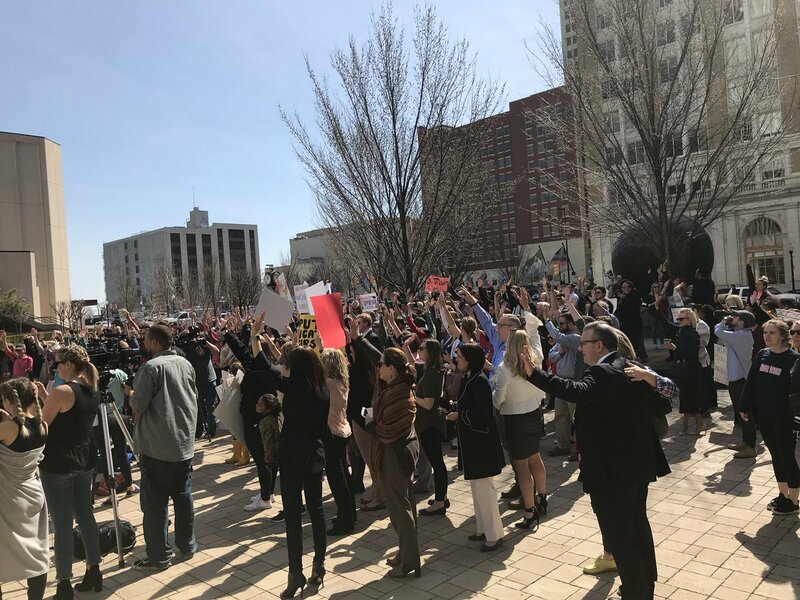 Though the $400 million bill codifies significant gains for teachers, it falls well short of the April 2 demands raised by the OEA and others. Teachers will get an average $6,000 raise, but the funding to reverse cuts to schools is minimal, as are the proposed pay increases for support staff and state workers. On Thursday, superintendents showered praise on the bill. Most have announced they will close schools on Monday for the capitol action, though others say that school will be now be open. Yet even many of the superintendents who continue to support April 2 are now explicitly framing this as a one-day rally only. It remains to be seen whether the wavering superintendents can be pressured to support an ongoing work stoppage — or whether the majority of school workers are prepared to strike without their support. Like many superintendents, the OEA leadership appears to be trying to avoid a strike by transforming April 2 into a one-off action, after which teachers would return to work. The unattained demands could then be fought for through less disruptive means. Yet it is also clear that union leaders do not trust the legislature — and are worried about getting overtaken by the rank and file. As a result, the April 2 protest has not been cancelled, and Alicia Priest, the OEA president, declared in a video update that “we will stand with our members as long as our members want.” In the face of a massive bottom-up push for an ongoing work stoppage, it is likely that the union leadership would accede to the sentiment of the ranks to keep striking after Monday. The rank-and-file’s response on social media has so far been critical of the union’s relatively non-committal stance. Though many are worried about the disorienting effect of wavering superintendents, sentiment in favor of an ongoing work stoppage remains widespread. Don’t forget who is in charge . . . over the next couple days schools might be canceling their support. We teachers control our destiny! We have come too far to accept this offer that does nothing but put a band aid on a severe wound. . . . They will have no choice but to close down the districts! We need to start scheduling meetings with people in our buildings and figuring out what the majority want to do. It is impossible to foresee how events will play out over the coming days. In the face of considerable obstacles, the determination of teachers and staff will be put to a severe test. So too will the organizational capacity — and tactical ingenuity – of Oklahoma’s rank-and-file activists. Victory won’t come easy. But as West Virginia shows, one should never underestimate the power of a workforce that has said enough is enough.